This might have been cool thirty years ago, when it came out, but the movie definitely doesn’t hold up or having anything special compared to movies of today. 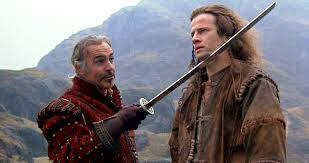 Highlander has got a pretty interesting setup and tagline, but other than that, and a handful of entertaining scenes at the beginning, there’s not a whole lot going on. The plot is about these guys called highlanders, who have been around for thousands of years, living among us, as immortals. They live by the credo, “there can be only one,” and are on a mission to kill each other, but we never learn why. We get lots of flashbacks to how Connor McCleod learned that he was immortal, and these are the best scenes of the movie. Once the film starts focussing only on the modern day stroyline, however, the interesting ideas go out the window and the movie starts to become routine and ordinary. I only wish the movie gave more thought to it’s explanations than just leaving it at that. For example, why exactly do these guys want to kill each other? Why can there be only one? It seemed like there was a connection between these guys, like a way that they could feel each other and know where the other ones were (kind of like Cerebro in the X-Men movie being used to help mutants find other mutants,) only in Highlander, none of it was ever explained. And so we were left with a movie that featured a cool tagline and premise with little clarity or detail. It was told as two parallel stories running side by side at different points in time. There was the story of the past and then the story of the present. The story of the past showed this man, Connor McLeod (pronounced Macleod), as a primitive swordsman living out in the hills of Europe, discovering his immortality. This was the more interesting story of the two, and yet it still left a good deal to be desired. The other story was about McLeod in current day New York, where another one of the Highlanders tracked him down. This second story involved police investigations and romances as well as many chase scenes. Between the two stories, it was this second one that felt more like the usual thing, with one chase or fight sequence after another, and none of it amounting to very much. The thing that worked about the first story was that we got to see McLeod before he knew who he was and that he was different from everyone else. We saw him fight in battle, along with his tribesmen, and we saw him get killed. He was buried and everything, and his friends carried on in sadness. Then the next day, McLeod reappeared at the local pub and sat down to join his friends for a drink. Only they didn’t appreciate him still being alive, and considered him a ghost or spook of a creature that made a deal with the devil. All of this reminded me of the more recent scene in Dallas Buyers Club where Matthew McConaghey tries to join his friends at a bar, after learning he is HIV positive, only to find out that he is no longer welcome to sit with them. the first story might be the better one, but even that could have used some improvement. We are following Connor the whole time and are there when he is buried in a coffin, but we aren’t there when he wakes up. Instead of experiencing this from his point of view, and seeing him wake up in a coffin, we take on his friend’s perspective, sitting at the bar when Connor walks in. we could have gotten it both ways, seeing Connor wake up first, and that would have been a much more interesting approach. Sean Connery is in the movie too, and he’s the big name star of the film. 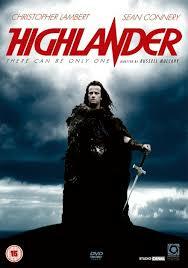 Apparently he’s in the sequel, known as Highlander II: the quickening, as well. Here, he is flashy and entertaining, but his part feels very short-lived. He pops up in the middle of the movie for a few scenes and then is gone for the rest of the film. Still, in those few scenes Connery definitely makes his presence known and his bright red outfits, as he plays a Spanish adventurer, are hilarious. At about the halfway point of the movie or so, we transition from alternating between both stories to just watching the current story. The flashbacks are done and now we are just with McLeod in the present day as we walks around the streets trying to avoid both the cops as well as this other Highlander who is hunting him. McLeod works at an antique store and there’s a female forensics expert who is hot on his case. Soon the two of them are seeing each other and keeping their affair a secret from the world. This story doesn’t go very far. There is no mystery to it, and really the whole thing is composed of uneventful chase scenes. The villain is annoying and over the top, and without any surprises, the second half just feels tiring. It’s predictable and routine and exactly what we don’t want at this point. And then there’s the idea that the only way to kill a Highlander is to cut off his head. Like everything else in this movie, it’s a cool idea on the surface, but when you think about it, they’re actually telegraphing for us exactly how the movie will end. On top of that, the more heads being cut off we see, the more desensitized to it we get. There are at least three here, and so by the time the final one comes, we certainly don’t think it’s anything special. This movie is okay at best. The action is occasionally entertaining, but it’s the plot about immortals living among us that is really the strong point of the film. Considering that the whole idea and tagline is that “there can be only one,” it’s pretty ridiculous that this is never explained. Do they become weaker when other Highlanders are around? As a goofy b movie, this one is fine. But it is far from anything special.